The British-led expedition to find the "Endurance", Sir Ernest Shackleton’s ship, has been defeated by horrendous weather and pack ice. The expedition was called off on Feb 14 after extreme weather conditions led to the loss of an autonomous robotic submarine that, it was hoped, would have located the wreck. The expedition reached the wreck site earlier this week, relying on detailed records left by Frank Worsley, the captain of the "Endurance", and deployed the AUV. It was on the final leg of a 30-hour mission, 3.000 meters beneath the ice, when contact was lost between it and the "SA Agulhas II". It was not clear if this was the result of just the difficult sea-ice conditions, or component failure on the sub, or even the robot colliding with an obstruction. It is conceivable of course that by the time of the break in communications, the sub had already captured images of "Endurance" in the Weddell sediments - but that will never be known. An AUV has to be recovered first for its scan data to be pulled off and examined. 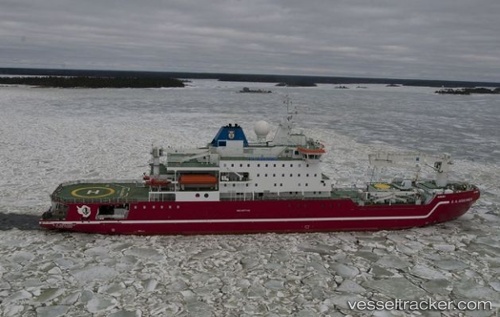 Running the risk of becoming trapped in the ice itself, the polar research vessel then had to withdraw. Frustratingly for the team, it is not known whether the submersible captured images of the "Endurance". Oliver Plunkett, the head of Ocean Infinity, the American company which provided the underwater sub, said: “Everyone at Ocean Infinity is deeply disappointed that at the eleventh hour, we were not able to produce the images of what is without doubt the most challenging shipwreck in the world to locate. We understood the risks of pushing the boundaries of what’s been done before with technology operating in the harshest environment on the planet.” While it failed to find the "Endurance", the expedition in fact did collect valuable information on the Larsen C Ice Shelf, which two years ago calved a huge iceberg known as A68, which is four times the size of Greater London. That research will contribute to the understanding of how the continent is being affected by climate change. The expedition will soon embark on its return journey to Cape Town. The story of how Shackleton managed to save his crew after the loss of the "Endurance" is one of the world’s great survival stories. They were members of the Imperial Trans-Antarctic Expedition, the objective of which was to make the first land crossing of the Antarctic continent. But after the three-masted "Endurance" became trapped in ice, eventually being crushed to bits after 10 months, Shackleton and his 27-man crew made their way north in lifeboats, sailing over stretches of water and dragging them over ice floes. They reached Elephant Island, at the tip of the Antarctic Peninsula, where Shackleton left the bulk of the crew. Leaving them to subsist on penguins and seal meat, he then set off with five others, in a tiny boat, to try to reach the island of South Georgia, 800 miles away. Remarkably, they made it, but then had to haul themselves over a range of mountains in order to reach a whaling station on the other side of the island. After regaining his strength, Shackleton succeeded in rescuing the rest of his crew from Elephant Island. Not one man died. Shackleton embarked on another Antarctic expedition in 1921 but died on South Georgia at the start of the journey. A scientific expedition in the Antarctic has set out aboard the "S.A. Agulhas II" on a quest to find Sir Ernest Shackleton's lost ship "Endurance". The team has spent the past two weeks investigating the Larsen C Ice Shelf and the continent's biggest iceberg, known as A68. And this puts it just a few hundred km from the last recorded position of the British explorer's vessel which was crushed in sea-ice and sank in November 1915. Shackleton's extraordinary escape from this loss, saving his crew, means there is considerable interest in finding the wreck, resting on the ocean floor, some 3000 meters down. The Weddell Sea Expedition 2019 team wants to grab the chance of making the discovery, using robotic submersibles. The aim is to photograph it, document the precise location and report these to the UK authorities for designation as a historic site through the Antarctic Treaty. The wreck will be then protected and people that might want to take an expedition there to retrieve items wouldn't be able to do so without permission.. On Jan 27, 2019, the researchers announced that their work at Larsen and A68 was complete, and that they would now concentrate on finding the wreck.